Vermont marriage licenses are issued by the towns. Non-Vermont-residents may apply to the Hyde Park Town Clerk by mail, email or FAX. We can provide the marriage license application form which is returned directly to the town clerk. A copy of the decree should accompany the application for any applicant who has been divorced. License fees not are included in any wedding or elopement package at the Governor’s House. The fee for a Vermont marriage license now is $60 plus $10 for each certified copy of the completed marriage certificate. Your marriage certificate will be mailed directly to your home after the ceremony. Vermont residents must apply for marriage licenses in their towns of residence. 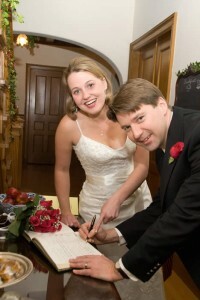 Vermont marriages are valid for residents from other US states or from outside the USA.